Check out our FREE Pond Design Guide! If you are considering having a water feature professionally installed (or doing it yourself) on your property, we are here to serve you in more ways than one. We gladly offer FREE ESTIMATES quoted over the phone. We offer FREE DESIGN SERVICES if you visit us at our Pond Construction Headquarters here in Yucaipa, California. We offer ON-SITE Waterscape & Pond Design Consultations for a nominal fee. Our On-Site Design consultation fees are very reasonable and the consultation fee is credited to your contract price should you choose to have The Pond Digger, Inc professionally install your waterscape. No consultation fees are charged for commercial jobs. 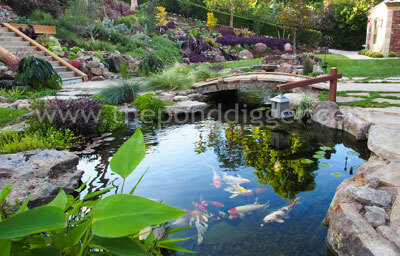 An on-site pond design consultation is a great investment of your time and money. A professional waterscape designer from our company will walk you through the entire pond design process on location where you are planning to build your water feature. You will be interviewed and then educated about a variety of different possibilities regarding the construction of your water feature, help you understand your future maintenance responsibilities, and explain the differences in pond construction equipment available on the market. Simple decisions in the planning stages or your pond can save you plenty of money. For example, choosing the right “Energy Efficient” pond pump for your project can save you a pile of money on you monthly electrical bill. Choosing the right filter system for your project may be the difference between the pond meeting your expectations or not. When you schedule and professional on-site design consultation with our company, we send out an actual POND CONSTRUCTION DESIGNER to your property, not a Salesman! There is a big difference you see. A SALESMAN that visits your property FREE OF CHARGE will have the tendency to be pushy and SELL you what he or she thinks they can sell you without making suggestions to what may make or break your overall enjoyment of the feature. It is difficult for a SALESMAN to actually SELL a pond if they were to deliver as much information as we provide. With that being said there are many contractors that only offer ONE POND SYSTEM on their FREE CONSULTATIONS so they have a better chance of closing a deal with you. 30% of our construction business each season is rebuilding and or retro fitting ponds that were improperly built by landscape contractors. Believe it or not, when we ask the homeowner if they originally paid for a design consultation when meeting with the original contractor: They all say, “NO”. All lot can be revealed in our interview process about what your expectations are and about who we are. A small design consultation fee could literally save you thousands of dollars. Visit our Ponds Gone Wrong page and see first hand some of the FREE CONSULTATION jobs we have been called upon to rebuild. Do yourself a favor and use our Contractor Warning Report before bringing a salesman onto your property for a FREE QUOTE. We want your water feature to be a shining success story! Our waterscape design consultants are trained to walk you through an interview process we call our, “Waterscapes Needs Analysis”, to determine just what exactly your wants and expectations are for your future waterscape. Once the interview process is complete, then we set fourth to design the perfect waterscape to match your exact needs. Our pond design consultants can give you creative insight through the eyes of literally hundreds of professionally designed ponds and water features including disappearing pondless waterfalls, and rock column fountain. Free Pond Design Estimates are gladly given over the phone. We simply need to know the dimensions of your desired pond, disappearing pondless waterfall or rock column fountaindisplay you are considering. We can give you a close figure of what your waterscapes will cost to build by square footage alone without having to walk onto your property. 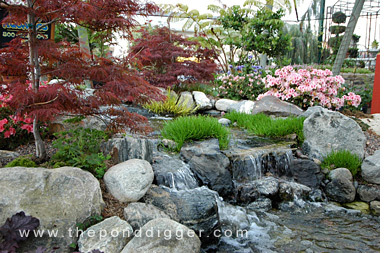 Please bring photos of your pond construction location, tell us what kind of water feature you are interested in. You will need to give our pond design team dimensions of the water feature. Feel free to show up without an appointment but be prepared to drop off your photos and information for review, in case all of our designers are out in the field on appointed pond design consultations. We have dozens of Do-It-Yourself weekend warrior pond builders each month take advantage of this. Please email us a digital photo of your pond construction site. Tell us what kind of waterscape you are interested in. Please supply our pond design team with dimensions of the waterscape you wish to have installed, too. There is more to it than just water. The cost of any water feature can vary depending on the location you have chosen, the type of water feature that best suits your needs and of course what equipment you are using during pond construction. This is the reason The Pond Digger offers on-site waterscape design consultations at your home or business. We charge a nominal fee for pond design services and then apply that fee to your contract price, should you decide to use our company for on-site professional pond construction. If you have already consulted with another pond contractor and want a second opinion, we offer to discount any pond consultation fees that you may have already incurred, should you decide to have The Pond Digger build for you. We simply need proof of payment and don’t even need to see an estimate. We want you to get the biggest bang for your buck and get it done right the first time! 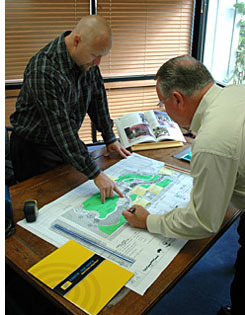 When you pay a pond design consultation fee you will have a designer show up at your home, not just a salesman! Your design consultant will conduct a complete evaluation of the area where you wish to install the feature and give you recommendations to match your landscape and your budget. Your consultation includes education in the differences between various water gardens and koi pond construction installations, rock column fountains and disappearing pondless waterfall systems. At the time of your design consultation, in most cases we will be prepared to give you not just an estimate but firm pricing for your waterscape installation and review available construction dates. We urge you to stop by our pond construction warehouse showroom or visit some of the ponds displayed on our 365 Pond Tour.You will see firsthand the products that will be used in the construction of your waterscape, and get a chance to see some water features first hand, up close and personal. We are based in Yucaipa, California and service the entire Southern California basin including, San Bernardino, Riverside, Los Angeles, Orange County, Venturaand San Diego Counties. However we also have a network of qualified contractors that we are connected to not only across Southern California but also across the entire United States, from Northern California all the way to Florida. So if we can’t help you personally we can direct you to several different companies that will accommodate your pond construction and pond design needs.